Never forget to say "I Love You" to your sweetheart. Let them know your love is never ending by giving them this beautifully Engraved Heart Clock that says so. This romantic Couples Clock makes a wonderful Wedding, Anniversary or Valentine's Day Gift Idea. 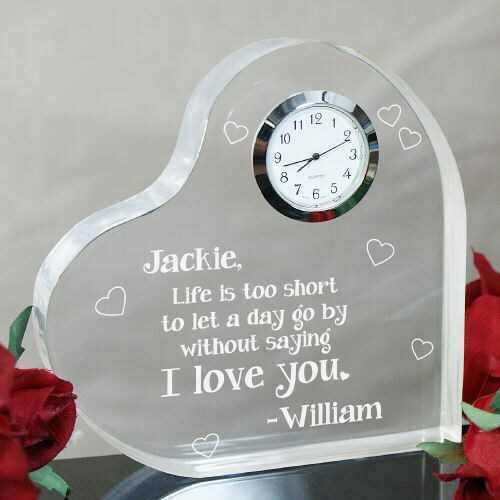 Our elegant & clear Personalized Heart Clock Keepsake measures 5" x 5" with edges measuring 3/4" thick, featuring a silver edged timepiece with quartz movement. Includes FREE Personalization! Personalize with any couples names. Totally amazing!!! recommend 100% engraving was perfect as was everything else described. Additional Details 800Bear.com features an wonderful collection of fun & romantic gifts to present your sweetheart. Present them with more then just a bear, give them a Romantic Keepsake they'll always enjoy as well.